Right around the time your toddler picks up her pace to run, she begins experimenting with jumping. Jumping enhances several developing skills, which we’ll explore below. First, let’s take a look at when and how toddlers learn to jump. In general, children who are walking, climbing on and off of furniture, walking up and down stairs with help, and beginning to run are ready for jumping. This typically occurs between months 16-18. Your little one will start off jumping in place, her feet barely leaving the floor. She will progress to jumping off of a low object (like a stair, stool or curb), landing on both feet. Then she will start jumping over objects, hopping forward, and eventually hopping on one foot. Muscle Strength — Jumping requires a lot of strength and power, thus continuing to develop muscles that are important for all gross motor movement. Bone Strength — Jumping puts a good kind of stress on bones—the kind that helps them grow and harden. Motor Planning & Sequencing — Jumping requires continuous motor planning and sequencing—skills that allows us to plan and execute our movements in order to safely navigate our environment. When jumping, your little one uses motor planning to judge distance, evaluate how much power is required to jump and land, plan her movements, and then execute the jump in the proper sequence. Balance — Jumping employs a new level of balance for your little one. Health — Physical activity is integral to overall health, and jumping is central to much of children’s typical physical activity (playing on play structures, dancing or engaging in games like hopscotch). Research shows that today’s children are less physically active, which puts their ability to master jumping at risk, and not mastering jumping can discourage them from being physically active. Read more about the link between jumping and lifelong fitness and health here. Social Interaction — Because jumping is a central feature of children’s play, children who are not confident jumpers may shy away from activities, games and sports that build valuable social skills. 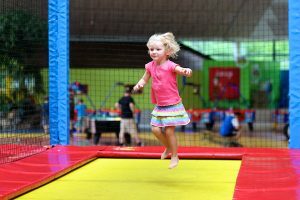 If your child is nearing age 3 and isn’t able to jump, doesn’t have enough power in her legs to get off the ground, falls frequently while jumping, only pushes off from one side, or demonstrates extreme fear of jumping, check in with your pediatrician or a pediatric physical or occupational therapist for guidance. Try searching our BabySparks program by milestone and find several fun, age-appropriate activities you can do with your child to practice jumping. Aside from playing jumping games with her, spending plenty of time outside, at playgrounds, and with other children will motivate her to practice this fun and valuable skill.